Corpsepaint Creatures by Francesca Bunny Williams. This was originally produced as part of the Creatures of the Night exhibition held at Supersonic Festival 2008. 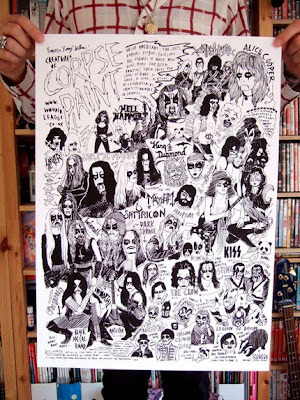 The screenprint was produced in July 2009 and first made available at Supersonic Festival 2009. Limited Edition screenprint signed and numbered out of 40. Will be rolled and shipping in poster tube. PLEASE NOTE. Each print is unique and quality (particularly where there are fine lines) will vary slightly from the original digital image. Another Great Record Store Bites the Dust.